TS ECET 2019 Spot Admissions notification to be released on July 20. 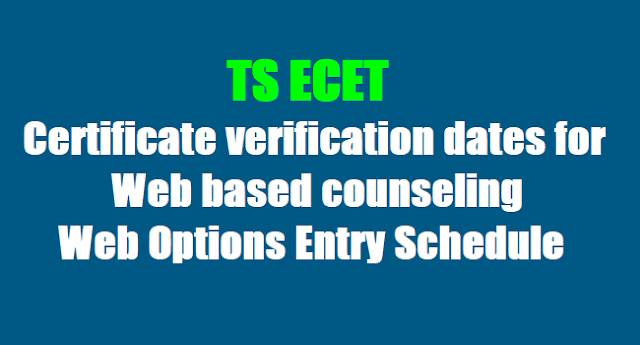 TS ECET 2019 Certificate verification dates for Web options entry, Seat allotments : TS ECET 2019 Final Phase Certificate Verification Dates/TSECET.IN Telangana ECET 2019 Verification of Certificates,Web options Entry, Seats allotment : A Common Entrance Test designated in full as Engineering Common Entrance Test for Diploma Holders and for B.Sc. (Mathematics) Degree Holders and in short as ECET [FDH and B.Sc. (Mathematics)]-2019 will be conducted in every year by JNT University, Hyderabad on behalf of the Telangana State Council of Higher Education for the academic year 2019-2019 for B.Sc. (Mathematics) degree holders. 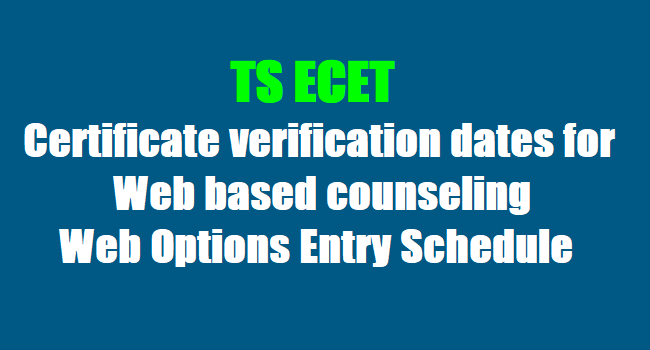 TS ECET Spot admissions 2019: The lateral entry Admission (Diploma Holders including Pharmacy and BSc Maths) into Engineering / B Pharmacy courses that the spot admissions for unfilled vacancies will be condcuted on ..-07-2019. The guidlines and schedule are placed on the website. Interested candidates shall approach principals of Engineerin/ B Pharmacy colleges concerned with all original certificates and fee. 4. The Special Category Candidates (Sports/Ncc/Cap/Ph) Who Did Not GettheirCertificates Verified Earlier Should Get Their Certificatesverified Now At Sankethika Vidya Bhavan, Masab Tank, Hyderabad Only. Diploma/ Degree Memorandum of Marks. Study Certificate from IV to Diploma (9th class to degree in case of B.Sc). Income Certificate issued after 01-01-2019 by competent authority, if applicable. Physically Challenged (PH)/Children of Armed Forces Personnel (CAP)/National Cadet Corps (NCC)/Sports and Games/Minority certificates, if applicable. Residence certificate of either of parents in Telangana for a period of 10 years in case of Non-Local candidates Residence Certificate of candidates for a period of 7 years preceding to Qualifying examination in case where the candidate has no institutionalized education. NCC & Sports- Certificates issued by competent authorities. 1. A Candidate who has secured 45% (For OC) and 40% (SC/ST/BC) aggregate marks in Diploma or B.Sc Degree Examination is only eligible for Admission. 2. B.Sc. (Maths) Candidates will be considered for allotment of seats after exhausting all The Diploma candidates in the merit list in terms of G.O.Ms.No.49, Higher Education, EC-II Dept, Dated: 04.06.2011. 1. Processing Fee: Rs. 1000/- (OC/BC), Rs. 500/- (SC/ST). (At the time of Certificate Verification). JNTU Hyderabad issued the Telangana ICET 2019 notification and the University invited online applications from the eligible candidates from as per schedule through online mode at its web portal https://tsecet.nic.in/. The Students who were applied for this stream, they were appeared the engineering common entrance test 2019 which was conducted as per schedule. The results of entrance test were released and appeared Candidates are checked their results from telangana ecet web portal https://tsecet.nic.in/. TS ECET Officials has given certificate verification schedule for admission into above said courses. The Qualified candidates of TSECET-2019 (Diploma holders of all branches including Pharmacy & B.Sc. Maths) are informed that admission into University and Private Engineering Colleges will be conducted based on Web Counseling. The detailed procedure of Web counseling and other instructions can be had from the Help Line centres on the day of Certificate Verification or it can be downloaded from the website https://tsecet.nic.in . TSECET-2019: The Qualified candidates of TSECET-2019 (Diploma holders of all branches including Pharmacy & B.Sc. Maths) desirous of seeking admission into B.E/B-Tech/Pharmacy courses (Lateral Entry into second year) in University and Private Engineering Colleges are informed to attend Certificate Verification in any one of the designated Help Line Centers (HLCs) as per schedule given here under. 9. Integrated Community Certificate, Aadhar Card and father’s Caste certificate in case of BC/ST/SC issued by the competent authority. 10. Income certificate issued on or after 01.01.2019. (in case of Ex-Service men) and Service Certificate (in case of inservice men) issued by Competent Authority for verification. Candidates whose parents are domiciled in the State of Telangana based on the permanent address/home town declared by them while joining the service and as recorded in their Service Register are alone eligible to be considered under “CAP” Category. 4. NCC & Sports - Certificates issued by competent authorities. 5. Minorities: SSC TC containing Minority Status or Certificate from the Head Master. 2. Tuition Fee particulars and seats available under Convenor Quota College wise will be made available on the website https://tsecet.nic.in. LAST ++ Means:Minority candidates including Not Qualified/Not Appeared in TSECET-2019 who have already applied to Convenor based on Diploma or equivalent marks. PH - (V)-Visually Handicapped, PH - (H)-Hearing Impaired Handicapped. PH-(O)-Orthopedically Handicapped, NCC- National Cadet Corps. Sports- Sports &Games, CAP- Children of Armed Forces Personnel. 1. The Candidate who has secured 45% (For OC) and 40% (SC/ST/BC) aggregate marks in Diploma or B.Sc Degree Examination is only eligible for Admission. 3. Candidates are informed that where there is more than one Help Line Centre in one place the ranks are distributed Help Line Centre wise. See the Annexure-I for distribution of Ranks (Integrated for Engineering Diploma holders and branch for Pharmacy and B.Sc (Maths))to attend for Certificate Verification. & Games, NCC (National Cadet Corps) should attend the Certificate Verification only at Sankethika Vidya Bhavan, Masab Tank, Hyderabad as per the dates given in the Schedule.